Whether inequality affects growth is an interesting question for at least two reasons. First, today inequality is a hot topic, and many claim it is bad for our economy. Is there any truth to these claims? Should we actively try to reduce inequality? Second, if wealth distribution matters for growth, then differences in development among countries can potentially be (partially) explained by their initial, historical wealth distributions. For instance, if inequality is good for growth, then it could be that countries with high inequality at the dawn of the Industrial Revolution (i.e. when growth kicked off) have done better than those with low inequality. The current view in economics is that inequality can have both positive and negative effects. In most of today’s economies, the negative effects probably prevail through their effect on human capital accumulation. This mechanism is covered in a classic paper by Galor and Zeira (1993) (ungated, Wikipedia). Galor and Zeira argue that if a person’s family is relatively poor, then she won’t be able to invest in education. This means that the wealth of one’s family is an important determinant of whether that person gets education. Aggregating this phenomenon over many people, we can see that the wealth distribution in society will determine how many people will invest in education, which in turn determines how productive society is, and in the end this affects economic output/development. The authors show that initial wealth distribution can matter in the long run as well. A country that currently has many poor and few rich people will stay poor. Even if the few rich people are very rich, the economy will remain poor in the long run. It is countries with large middle classes that can be the most successful. There is a possibility for government intervention here. As long as the government can subsidize education (at a cost lower than borrowing costs) by levying taxes on richer people who already get education without subsidies, we can improve economic output and welfare. The Galor-Zeira theory thus explains inequality’s effect through human capital. But in countries which are in early stages of development, human capital does not play an important role yet. So other forces might prevail. Consider the fact that richer people generally save more, even in relative terms (i.e. have a higher marginal propensity to save). Consequently, if the rich get a higher share of resources (i.e. if inequality is higher), then there will be more savings in the economy as a whole (because the rich save more than others). These savings will generally be invested in physical capital (e.g. infrastructure, factories). So economies with more inequality will have more investment in physical capital. This positive effect of inequality on physical capital accumulation will outweigh inequality’s negative effect on human capital accumulation at times/economies where physical capital accumulation is more important, and education is not (yet) that important. This describes the period of the Industrial Revolution quite well, but also the situation of today’s poor economies. It, however, does not really apply to today’s more developed economies. There is a recent working paper by Brueckner and Lederman (2015) (VoxEU) testing these theories using data from 104 countries over time, starting in 1970. They find that the region where inequality is beneficial for economic growth is very small (by today’s standards). It is found that only countries whose PPP-adjusted GDP per capita is below about $700 can benefit from higher inequality. More developed countries will not. The effect of a one percentage point increase in inequality (as measured by the Gini coefficient) on GDP per capita and average years of schooling are illustrated in the two figures below. 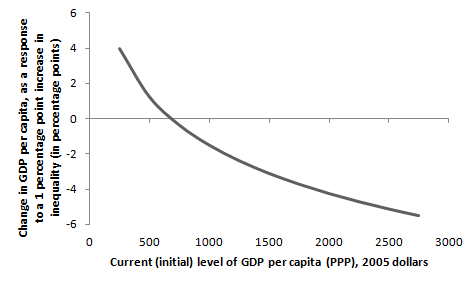 For GDP, the vertical axis is in percentage points meaning that e.g. a 4 percentage point GDP increase can be expected if inequality rises by 1 percentage point, if the initial GDP is around $300. For schooling, the units are years. So about 1 additional year of schooling can be expected, if the initial GDP is around $300. 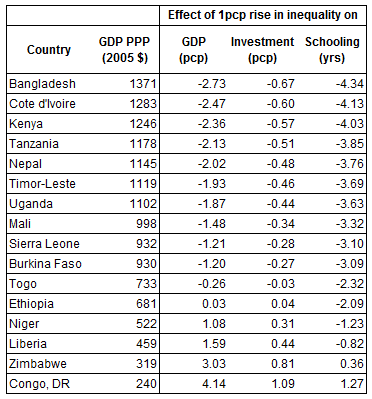 Here are some numbers for selected countries that are close to the boundary where the effect of inequality changes sign. For example, in Ethiopia a one percentage point increase in inequality would increase GDP per capita by 0.03 percentage points, investment by 0.04 percentage points, and decrease schooling by 2.09 years. 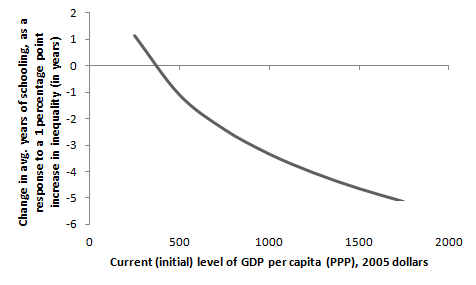 So in the end, it seems inequality is only beneficial for GDP growth in poor countries. Middle-income and advanced economies will find it detrimental. Looking at history, these findings are more interesting than they first seem. While today, relatively few countries have GDPs below $700, historically this was not the case. It is possible that historically those societies developed fast at first that had some degree of inequality. This could for instance explain why the Islamic world in the middle ages, where a rich capital-owning elite was missing for various reasons, could not keep up with the West around the time of the Industrial Revolution. And it could potentially explain more subtle differences among various Western countries as well. This entry was posted in Economic Growth and tagged education, human capital, inequality, investment, physical capital. Bookmark the permalink.